GOOD LORD. What the hell's gotten into Greg Oden? 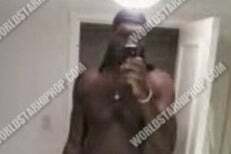 First he's spotted in a bright orange novelty T-shirt and now, he's one of the many too-proud athletes to snap a naked photo of himself in the bathroom. ABSOLUTELYNSFWORYOURMASCULINITYAFTERTHEJUMP. No, Oden is not riding on the back of Snuffleupagus in this photo. Poor Grady Sizemore.